In 1971, Istvan Kertesz went into the studio with an array of opera singers with whom he enjoyed performing to make a recording of arias, duets and ensembles from the most popular operas written by Mozart. The results, in terms of characterisation and energy, are in a class of their own, and what's more, the stellar singers blend together wonderfully in the ensemble pieces. 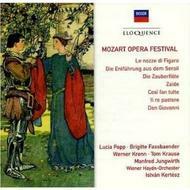 The collection appeared on a double-LP set entitled Mozart Opera Festival, together with a collection of Overtures. This is the first time the entire collection of vocal items is issued on a single CD, in the original sequence. �As a varied program, well recorded and with five of the best Mozart singers of their generation this reissue can be confidently recommended� - Goran Forsling, MusicWeb International.